Reilly says there is little sales cannibalization between Opel and Chevrolet. MUNICH -- Nick Reilly, the new head of General Motors Co.'s Opel/Vauxhall unit, also will oversee the Detroit carmaker's Chevrolet brand in Europe. "I will be Opel CEO and will oversee Chevrolet's sales and distribution activities in Europe," Reilly said in a conference call on Saturday. Reilly said he would be based at Opel's headquarters in Ruesselsheim, near Frankfurt, but Chevrolet will continue to be run from Zurich, Switzerland. Reilly, who was named GM Europe president on Friday, said Chevrolet Europe president Wayne Brannon will report to him. Reilly was head of GM's international operations based in Shanghai until Friday but had also been leading GM's restructuring of Opel on an interim basis since former GM Europe President Carl-Peter Forster quit last month. Reilly said GM Chairman Ed Whitacre had asked him to take on the role of GM Europe president and added that GM would not be seeking an external candidate to head Opel, as previously announced. He said he would announce his European management team next week and declined to answer questions on the future role of Opel Managing Director Hans Demant. Reilly said he had no plans to change the market positioning of Opel or Chevrolet and said there is little sales cannibalization between the brands. "The two brands compete in different parts of the market. Opel's competitors are Ford and Volkswagen while Chevrolet competes mainly against Japanese and Korean brands," he said. Reilly said internal GM studies have shown that less than 1 percent of Opel customers considered Chevrolet as an alternative purchase when buying an Opel car. Similarly Opel was way down the list of alternatives for Chevrolet buyers. "There is very little cross-interest between the brands," he said. Chevrolet is marketed as a value brand in Europe. In the first 10 months, GM sold 161,088 Chevrolets in Europe, up 1.2 percent on the year before, according to ACEA, the European carmakers association. Opel sold 914,846 cars, down 9.6 percent on the previous year. 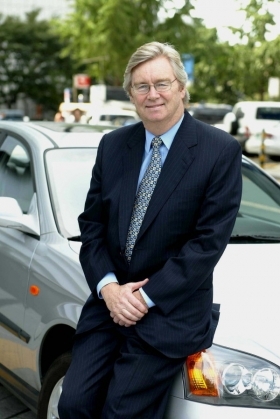 Reilly, 59, is a former managing director of Vauxhall who joined GM in 1975 with the former Detroit Diesel Allison Division in the UK. He has had several leadership positions with GM in Belgium, the United States, Mexico, and in Zurich, where he was GM Europe's vice president of quality and reliability.